Join us in a moment of silence on Friday, June 2 at 12 p.m.
TriMet asks the community to join in a moment of silence at 12 p.m. on Friday, June 2 to honor the men who lost their lives and those forever affected by the tragic events on a MAX train near Hollywood Transit Center one week ago. TriMet is now joined by C-TRAN and Portland Streetcar in observing the moment of silence on our transit systems. 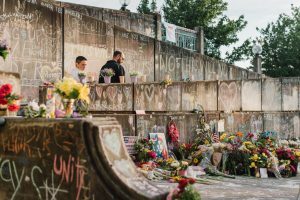 TriMet’s MAX trains that are at or nearing stations will hold at the platform and buses will pull over at a stop or along the route, if safe to do so, for the moment of silence. About 550 buses and 47 trains will be in service at noon. Also, about 200 LIFT paratransit vehicles will stop if it is safe to do so. All onboard the vehicles, at stations and stops or wherever they may be are invited to observe one minute in quiet reflection. It is likely some may gather at the Hollywood Transit Center for the moment of silence. Employees at TriMet facilities also will take part. In conjunction, C-TRAN buses and C-VAN vehicles as well as Portland Streetcars will hold at stops or along their routes, as safety allows, and invite everyone on board to participate. Riders and staff in other locations are also invited to join in the moment of silence. We all stand together as one to reject hate and offer this small tribute honoring the sacrifice made by Rick Best and Taliesin Namkai-Meche as well as the actions of Micah Fletcher.